I want to take a moment to address some comments from a resident at our recent township meeting regarding our firefighters. An accusation was made that we are overpaying these individuals and that the contract negotiated between the government Franklin Township, Franklin County, Ohio and Franklin Township Professional Firefighters IAFF Local 1441 is a waste of taxes. Let me be absolutely clear, the wages and benefits in this contract are fair and I fully support and stand by this unanimously approved collective bargaining agreement. When I started, our firefighters were one of the lowest paid professional firefighters in Franklin County. They face numerous challenges every day as they protect and serve our community. They run into burning buildings, the administer Narcan to those that have overdosed, and they save lives. These, and all first responders, deserve our respect and to be paid a living wage. This contract, while a major improvement, still places our workers in the bottom third of firefighters in terms of overall benefits and wages—something I will continue to work to close the gap and bring equity to. I strongly value the dignity of work and the efforts of our township's first responders. If you work hard, you deserve a fair and living wage. That is something that I will always fight for and believe in. When our roads crew's contract came up, the board of trustees worked together to give them an increase in wages that they deserved. We worked to raise the hourly wages of the administrative staff and have supported their efforts to join a union. Soon, our police will be negotiating a new contract and I intend to work with them to ensure they are paid fairly. This is something that is deeply rooted in what I believe. The American dream is to work a decent job that supports you and your family. All workers should have the right to join a union, negotiate a contract, and earn good wages and benefits. I will never back down on this value and will always fight to protect those that serve and those that need a fair shake. Together, we are able to improve the quality of life for all and that, I believe, is why I have been called to public service as one of your Franklin Township Trustees. With my first year under my belt as one of your township trustees, I wanted to let you know about some of the accomplishments that happened in 2018. These accomplishments improve the quality of the services our local government provides for you. Improving our township has been a top priority of mine since I ran for office, and we are making great strides. I spent much of this year learning about our township government, something that I thought was important as I worked with our fellow trustees to govern. 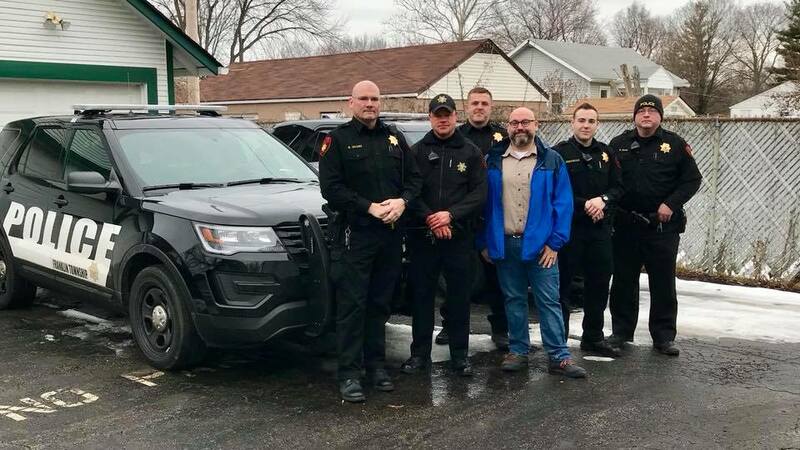 This meant spending days with our firefighters as they work with residents to get the medical help they need, a police ride-along that showed what our officers do to keep our township safe, and with our roads crew as they removed leaves from our streets and salted the roads in a snowstorm. This year showed that our township trustees could work together for the betterment of our community—a major improvement from years past. From combating the opioid epidemic to supporting our dedicated township employees, this last year was a major step forward for our township. Below are a few highlights of some of the great things our township is doing for you. As the epicenter for the opioid epidemicin Franklin County, we have moved quickly to institute new practices to fight back against this crisis. Our fire departmentis one of the hardest working in the region, yet they are one of the lowest paid. This year we worked to make inroads to end the inequity. Just a few years ago, we had to lay off most of our officers. Now our police department is fully staffed with 13 full-time officers plus additional part-time officers. With 32 miles of road in our township, our roads departmentworks hard to help make sure our residents have clean and safe streets every day. Improving our relationship with Franklin Countyand the region through increased partnerships has been a major focus in 2018. Looking toward 2019 and beyond, I will be working to continue to improve our services and responsiveness to residents. Part of this effort will center on recruiting and hiring a new township administrator who will help lead our community to greater sustainability and professionalism and equip our local government with the skills to recruit new businesses. Additionally, I will be working with our fellow trustees to seek out new economic opportunities, securing state and federal grants for public safety, negotiating a new solid waste agreement, and fighting to restore the state’s local government funds that help pay for some of our critical services. As always, it is my job to serve you and make our township a better place for all. Please feel free to reach out to me with your questions, comments, or concerns via email ataryeh@aryehalex.comor at (614) 594-9789. I look forward to hearing from you and seeing you throughout our township. Franklin Township, Franklin County, Ohio -- The economic depression and massive cuts to the State’s local government fund devastated revenue to Franklin Township and our professional fire department. For nearly ten years, our firefighters worked under the threat of layoffs and forgoed raises just to ensure that their coworkers were able to keep a job with a department and community that they loved to serve. Now, after three failed township fire levies, in November 2016 the voters of Franklin Township passed an operating levy that created stability for the fire department. With the resources to bargain, the township and representatives from the International Association of Firefighters (IAFF) Local 1441 spent two months negotiating a fair deal that helps equalize pay and benefits with similarly sized departments in the region and raises wages to be more competitive and ensure that firefighters are able to make a long term commitment to the township. “The members of Franklin Township Professional Firefighters Union, IAFF Local 1441, have endured decreased funding, increasing healthcare costs and staffing cuts over the past 9 years. It’s been rough on everyone at Franklin Township Fire Department,” said Ron Delozier, Firefighter and President of IAFF Local 1441. “This contract is a step in the right direction to improve our members’ livelihood. It gives our members a fair, comparable wage for our area. It also allows the department to stay within its budget, securing a brighter future for all of us. This agreement would not have been possible without the excellent working relationship shared between the members of IAFF Local 1441, the Fire Department Administration and the Franklin Township Board of Trustees. It's been just over one month since I was sworn into office and we have accomplished a lot. On our very first township meeting, I lead the effort to better accommodate our first responders by moving the public meetings up 30 minutes, created a fair system for residents to participate in those meetings by giving everyone equal time to comment at the end, elected as vice-chair of the board by my fellow trustees, give an employee a much needed raise—ensuring that all township employees now make over $15/hour, and started work to get more trees planted in our community by patterning with the Friends of the Hilltop. You can read all about this first meeting here. The most important thing I have accomplished this first month was to work alongside our three major departments and see what our amazing first responders and employees go through on a daily basis. I believe that it is critical that all elected officials understand what their employees do so that we can support them to the fullest. As one of the January snow storms moved into the area, I hopped in a snow plow truck and helped clear and salt the roads. I saw the hard working team of our roads crew work late into the night as they made sure the streets were safe for our residents. I joined Sgt. Edwards on second shift for a ride along with police officers. From arresting individuals with felony warrants to helping someone in a car accident, I saw the dangers that our officers go through every time they are on the street. I learned how much our police care about our community and the efforts that they go through to keep us safe. It was a wonderful learning opportunity for me and I now have an even greater respect for what police do everyday to protect and serve. Two weeks ago I spent 14 hours with our fire department, splitting my shift between our two fire stations. Our firefighters showed me all of the tools and equipment that our department uses to keep people safe in both our fire engines and medics. We dashed a patient who was having a stroke to the hospital, rushed to help someone who was going into cardiac arrest, and helped an individual get much needed medical attention. It was impressive to watch a trained firefighter insert an IV into a patient as the bumpy ambulance hurdled down the street. My admiration for our firefighters and all of our first responders and employees is now stronger than ever and I am proud to support the work that they do and to provide them the necessary tools and resources to be the best they can possibly be. We have a lot of great things ahead for our community and I look forward to working with my colleagues on the board of trustees to continue improving our township for all. Over the next four years, I look forward to tackling our challenges head on and with the force and vigor of a bull moose! Our firefighters, who are the lowest paid professional fire fighting department in the region, deserve to be fairly compensated for the life-saving work that they do everyday and we will work to raise their wages for the first time in almost a decade. We will make sure that the 20 and 30 year old equipment that our police and fire nervously rely on will be upgraded so that not only are our first responders safe but they can ensure the safety of our community. We will work alongside community, faith, and non-profit groups to develop new, homegrown solutions to help those struggling with addiction. Our police officers will be trained how to carry and use narcan and will be equipped with this life saving drug. Our residents, who see overdoses and drug use on a daily basis, will be invited to community meetings to learn how to make our community healthier. And we follow the lead of Columbus and make tobacco products harder for teenagers to purchase—ensuring that our next generation is as healthy as they can be. The era of our township being the laughing stock of the region is over. Today we reset our relationship with the City of Columbus and Franklin County. Our community is not alone in Central Ohio and we must begin to coordinate and collaborate with our partners across the region to ensure that we are all succeeding and growing together. The City and County are not our enemies, but our friends and we will work hand-in-hand to make our community the best it can possibly be. By hiring a township administrator, we will have an individual whose full time job will be to create policies that standardize and modernize our government and seek out new grants and funding opportunities. Gone are the days where our elected officials put down our community to the media and public. As the entire region grows in population, we will promote our corner of the county as the place for young families to buy their first home, send their kids to our great schools, and raise the next generation that will sustain our community for years to come. And finally, I pledge to you that I will always be professional. I will be polite, respectful, and courteous. I will respect our township employees and residents regardless of any preconceived notions. And I will be transparent and open about how we are moving forward. We may not always agree on the issues, but I will always listen and tell you where I stand—allowing us to build a relationship on trust and mutual understanding.